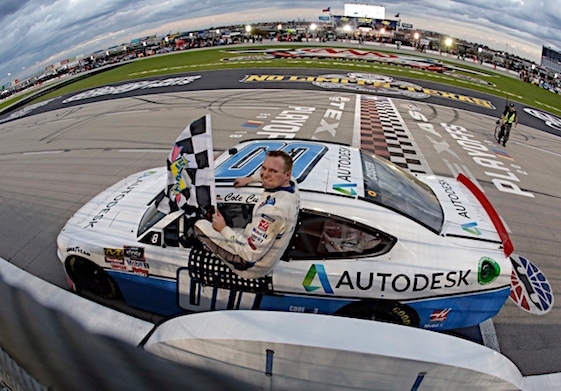 FORT WORTH, Texas – Cole Custer’s first NASCAR Xfinity Series victory at Texas Motor Speedway was aided and abetted by Stewart-Haas Racing teammate Kevin Harvick. This time around the high-banked/1.5-mile oval, Custer basically will be flying solo. Custer scored his first Xfinity Playoff win here last November after going to school on Harvick, the 2014 Monster Energy NASCAR Cup Series champion, two-time Xfinity Series champ and five-time Xfinity race-winner in Cowtown. “I’ve talked with Kevin a lot, especially my first year (2017), trying to figure out what I wanted to do when I went to the racetrack,” Custer said Friday afternoon before the opening practice for Saturday’s My Bariatric Solutions 300. “But I don’t want to bug him too much, so I try to figure it out on my own. I have a basic idea from what he told me and his ideas are really, really smart. It’s like trying to be a sponge. Custer will join an elite list if he goes back-to-back in Saturday’s 200-lap/300-miler set for noon (CDT). Only four drivers have scored consecutive Xfinity Series victories at TMS since the facility opened in 1997 _ Mark Martin (1999, 2000), Kyle Busch (2008 sweep, 2009 sweep, 2010 spring), Carl Edwards (2010 fall, 2011 spring) and Erik Jones (2017 sweep). In four starts at TMS, Custer has that one victory, four top-fives and an average finish of 3.750 that currently is best-in-series. Xfinity Series qualifying is scheduled for 9:10 a.m. (CDT) Saturday. Custer advanced to the Playoffs Championship 4 last year before finishing as runnerup to champion Tyler Reddick in the final standings. Custer also made the Playoffs as a rookie in 2017 en route to finishing fifth in points. Custer’s Xfinity resume includes victories at Homestead-Miami Speedway, TMS and Auto Club Speedway in Fontana, Calif.
Custer already has checked-off one major box this season with his win two weeks ago on the 2-mile Auto Club Speedway. That win locked him into the 2019 Playoffs. “It definitely takes some stress off,” said Custer, a 21-year-old resident of Ladera Ranch, Calif. “We’ve never won this early in the year so it’s pretty nice to go out there and race and not have to worry about points, or you haven’t won yet. Through five races this season, Custer has one win, three top-fives, four top-10s and a series-best average finish of 6.0_ stats that place him second in the standings to Reddick. Custer trails the Richard Childress Racing driver by seven points (220-213); Custer is seven points ahead of Christopher Bell of Joe Gibbs Racing.